Marshal of the Soviet Union Kirill Moskalenko, typed document signed on 30 June 1944 when Colonel General and commander of the famed 38th Army. Marshal of the Soviet Union Kirill Moskalenko, typed document signed on 30 June 1944 when Colonel General and commander of the famed 38th Army. 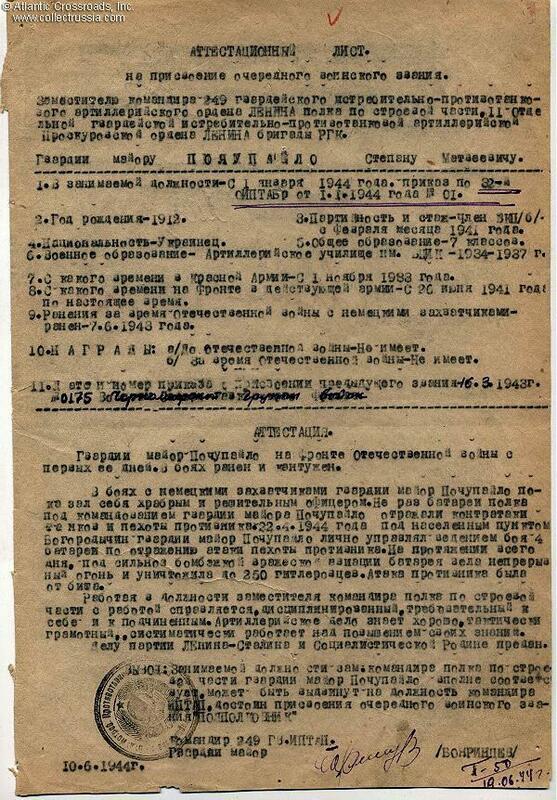 Also signed on the same day by his Chief of Staff, Maj. Gen. Aleksei Yepishev - future General of the Army and Commander of the all-powerful Armed Forces Political Department (while holding this position he wielded an enormous power in the military, was not answerable to the Minister of Defense and took orders only from the Politburo of the Communist Party). The document is a recommendation for promotion of a heroic antitank artillery major. Single page, front and verso, 7 ¾ " x 11 ½ ". Moskalenko signature in brown pencil on the verso is quite bold while Yepishev 's red pencil signature is precise and controlled. Recommendation for promotion of Guards Major Stepan Polupailo, deputy commander of the 249th Guards Antitank Exterminating Artillery Regt., 11th Guards Antitank Exterminating Artillery Brigade of the Supreme Command Reserve. The document cites Polupailo's excellent combat record and especially his performance in a battle against the enemy infantry and tanks on 22 April 1944. On that day he personally commanded a battery that was on the axis of the German attack and stood firm, destroying up to 250 enemy soldiers. Interestingly, despite his frontline service and several combat wounds, Polupailo had no awards as of the time of the evaluation. 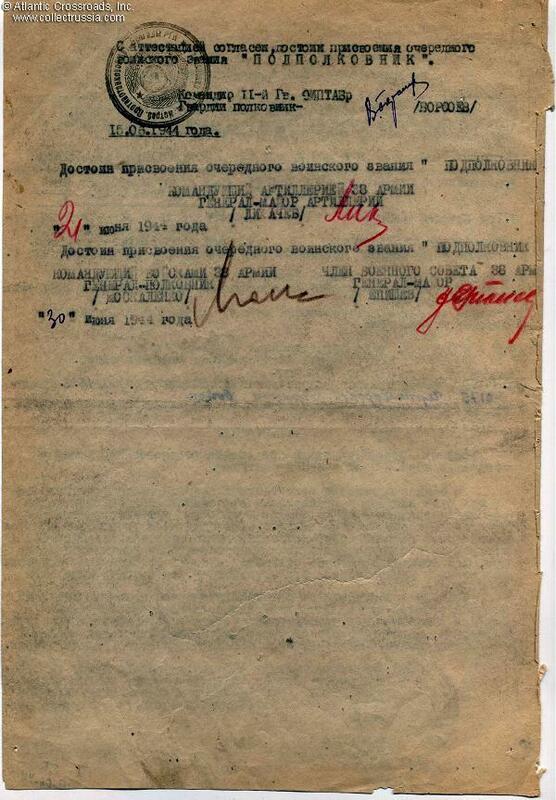 The recommendation to promote to Lieutenant Colonel was endorsed and signed by Commander of the 38th Army Col. General Moskalenko and Member of the Military Council of the Army Maj. Gen. Yepishev on 30 June 1944 (their signatures are in brown pencil and red pencil accordingly, on the verso). Promoted to Marshal in March of 1955, Moskalenko was twice declared a Hero of the Soviet Union during the Second World War. Prominent for his participation in the battles for Moscow, Stalingrad, and Kursk. He received seven Orders of Lenin, an Order of the October Revolution, five Orders of the Red Banner, two Orders of Suvorov 1st Class, and an Order of Kutuzov 1st Class, and an Order of Bogdan Khmelnitsky 1st Class. Commander in Chief of the Strategic Rocket Forces in 1960. Eventually known in the west for the prominent role he played in the arrest and downfall of KGB chief Beria. Aleksei Yepishev, on the other hand, would rise to General of the Army after the war although he was more a political operative than a military man. He eventually became Commander of the Soviet Armed Forces Political Department - a position of enormous power executing the Communist Party control over the military (he was not answerable to the Minister of Defense and was subordinate only to the Party Politburo). A man obsessed with the absolute necessity for extreme censorship to protect the armed forces from exposure to possible heresy, he was virtually a character straight out of Orwell's 1984! Very good to excellent condition. A small fraction of the page's paper (no more than 1/8" in the area of the signatures) has folded back on one side and now covers a tiny portion of the last letter in Yepishev's name. Rather than straighten out the paper just for a photograph and possibly risk damaging the document, we left it folded when we scanned the page; rest assured, the signature is complete and undamaged.